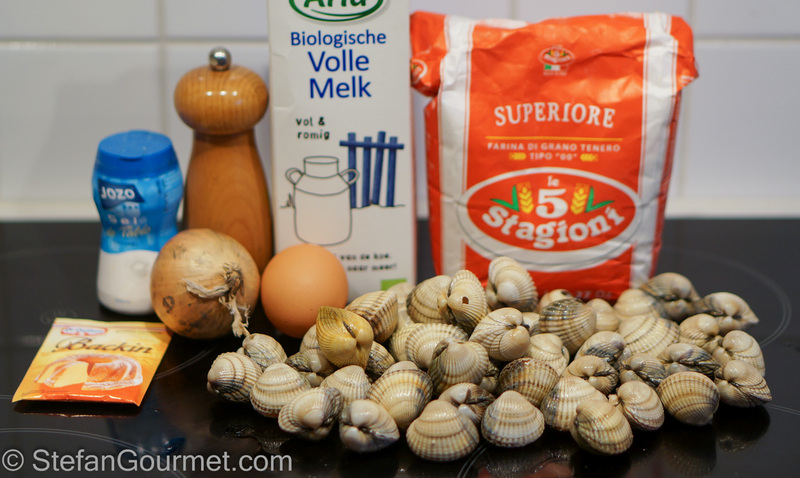 Clams were on sale (only 6 euros per kilo or US$ 3.50 per lb), which was a good reason to make clam cakes. 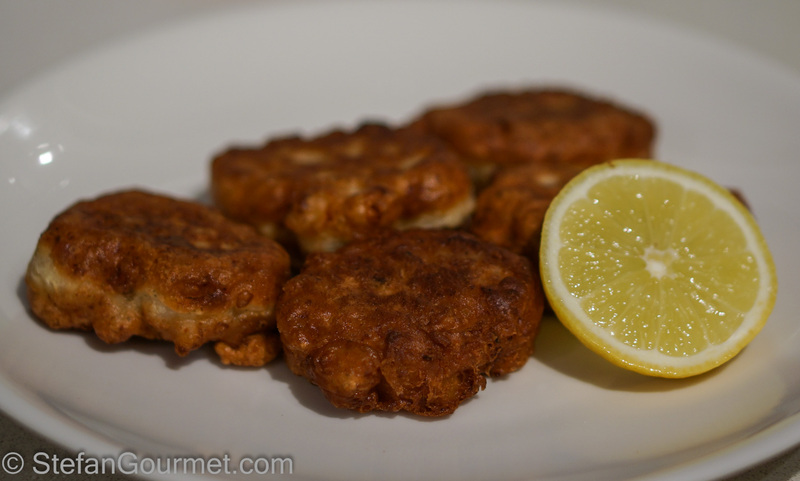 They originate in New England and are also called clam fritters. Chopped clams are mixed with a batter of flour, eggs, clam juice, milk, baking powder, salt, and pepper. Some recipes also include minced onion or shallots. The local clams in New England are quahog or hard clams, but you can also make them from other clams such as cockles or vongole. In the Florida Keys they are made using conch and called conch fritters. 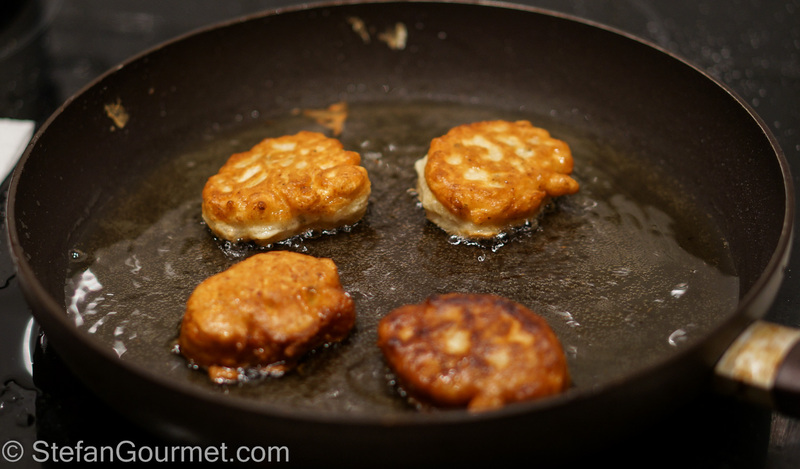 Good clam cakes are crispy and golden brown on the outside, and soft and airy on the inside with an elegant taste of the sea. They should be served with lemon and mayonnaise or a mayonnaise-based sauce such as remoulade or tartar sauce. Chopped clams are also sold in cans, but fresh is of course much better. 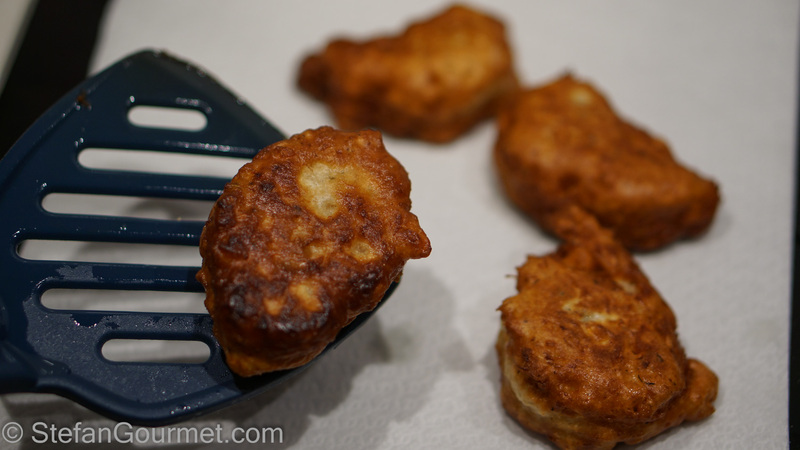 Clam cakes can be either deep-fried or shallow-fried. 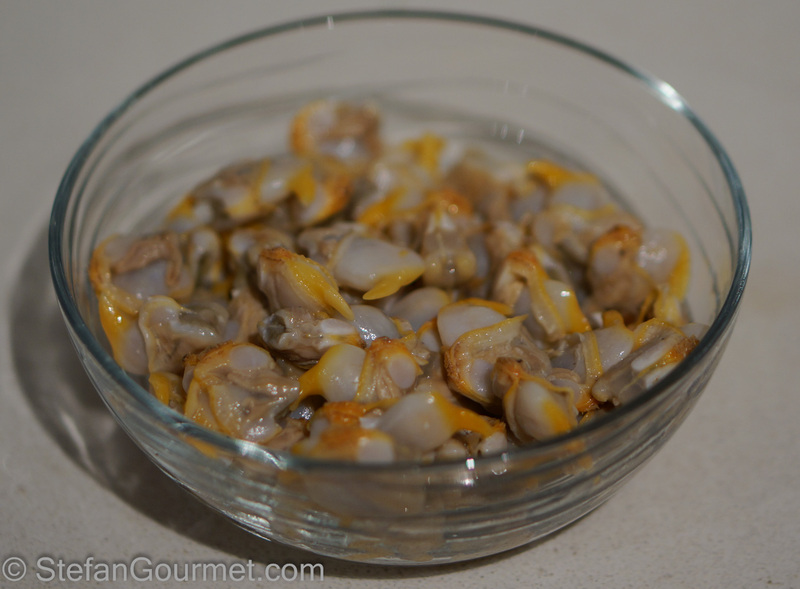 Put the clams in a litre (4 cups) of water with 30 grams (4 tsp) salt, which is as salty as the sea and will invite the clams to purge themselves. 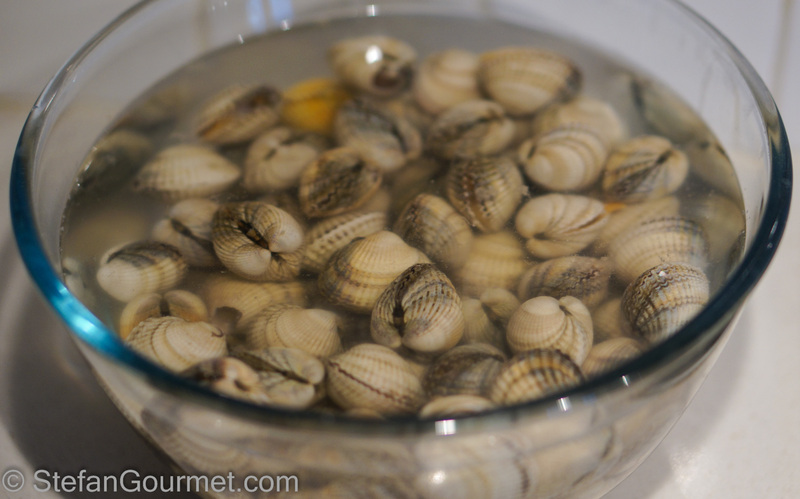 After an hour, rinse the clams with cold water to remove the salt. 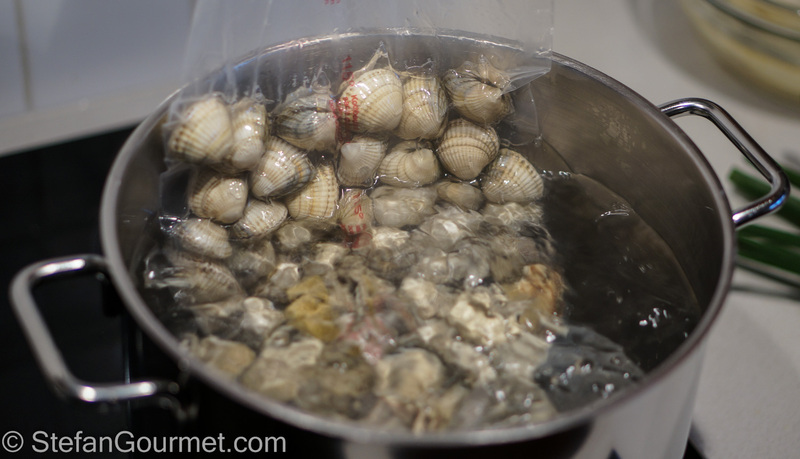 The traditional way to open the clams to get out the meat is to put them in a covered pan with a bit of water and cook them over high heat until they open. …and to submerge the vacuum sealed bag in water that is almost boiling for 4 minutes. This is cooking sous-vide at 95ºC/200ºF. The advantage is a lower risk of overcooked clams and a higher yield of clam juice. After 4 minutes the clams will have opened. 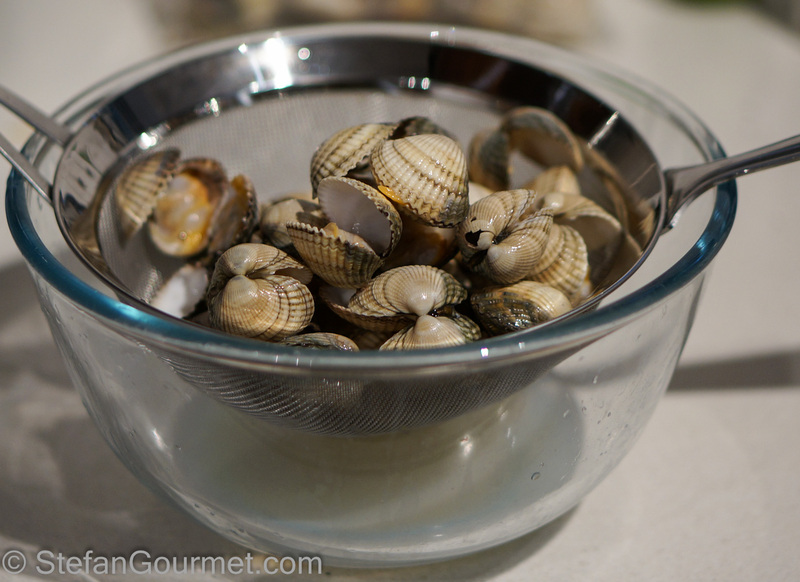 Use a fine sieve to harvest the clam juice. You won’t need all of it for the clam cakes, so reserve the rest for a seafood risotto or pasta. 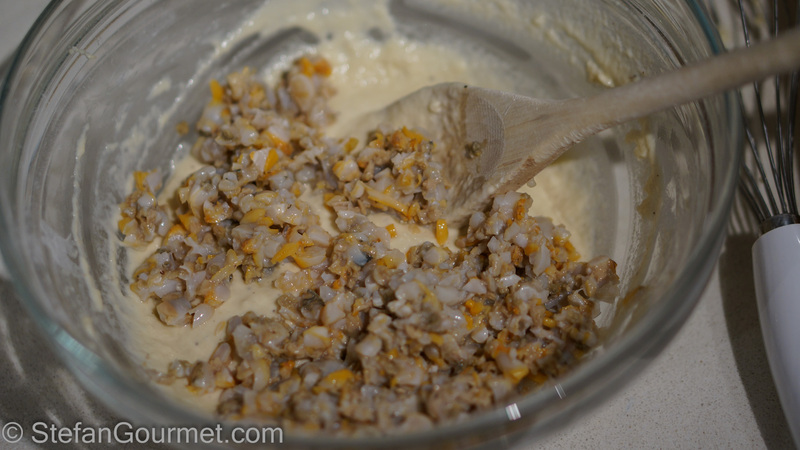 Take the clam meat out of the shells. From 1 kg of cockles I ended up with 200 grams of meat. 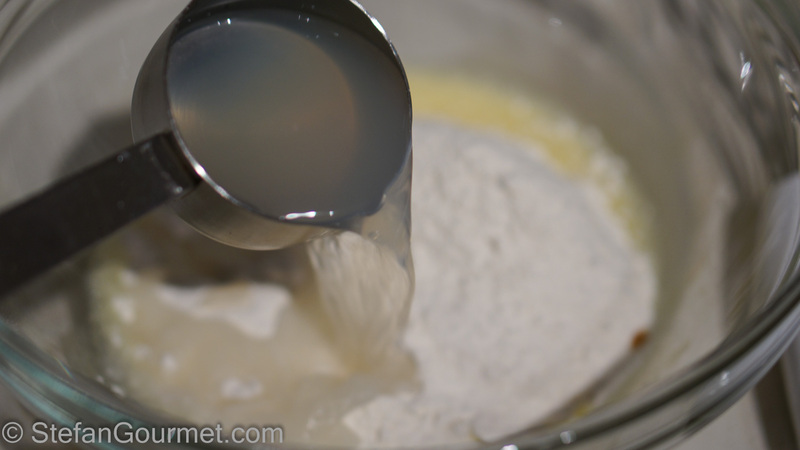 Add the flour, salt, baking powder, and clam juice. Stir to mix. Add the milk slowly and keep stirring. Not adding all the liquid at once helps to prevent lumps. 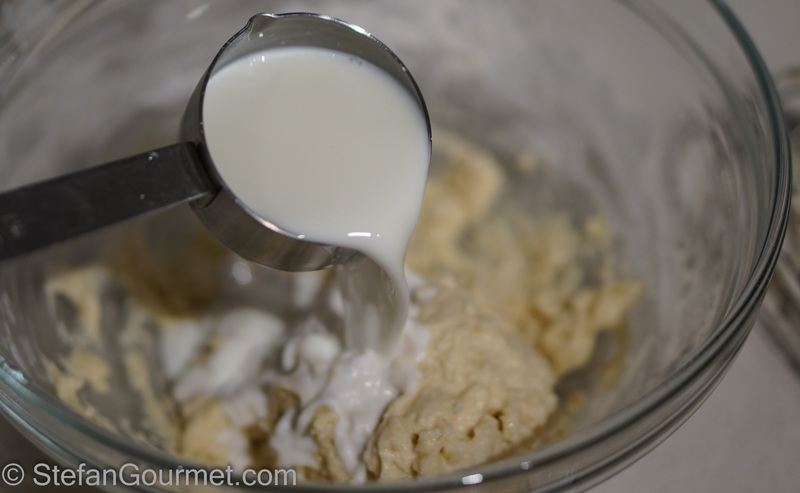 Keep adding milk until you have a thick batter. 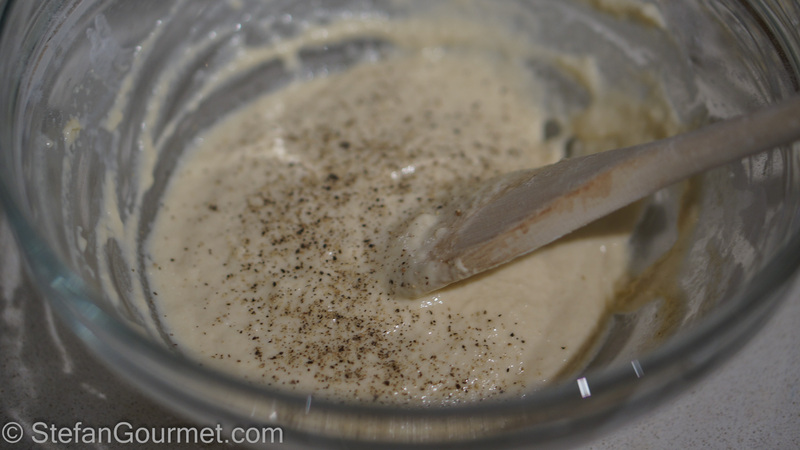 Add freshly ground pepper to taste and stir to mix. 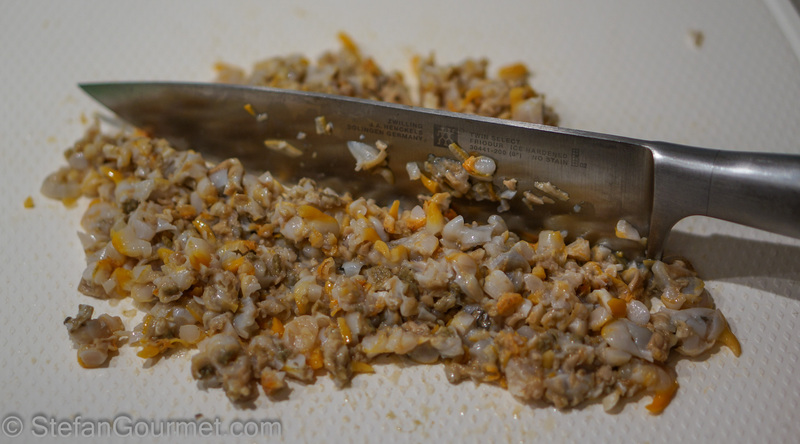 Fold in the chopped clam meat. Heat up about 1/2 cm (1/4 inch) of vegetable oil in a non-stick frying pan, or 2 litres (2 quarts) of vegetable oil in a deep fryer. The oil should be about 160ºC/320ºF. 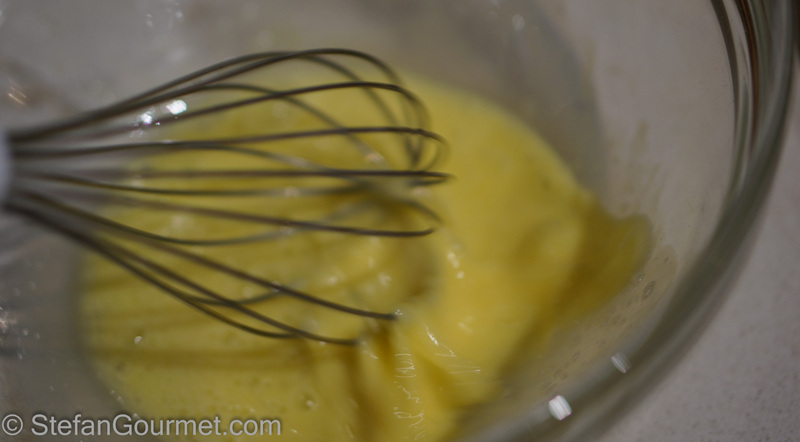 Gently lower tablespoons of batter into the hot oil. Turn them after about 1-2 minutes and continue to cook until both sides are golden brown, about 3-4 minutes total. Once they are golden brown on both sides, transfer the clam cakes to kitchen paper using a strainer to absorb excess oil. 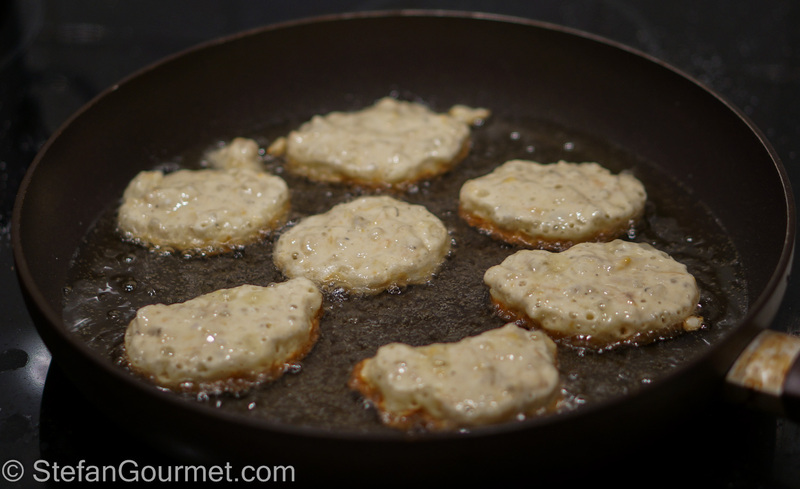 Serve hot clam cakes with lemon juice and mayonnaise, tartar sauce, or remoulade sauce. Spaghetti ‘Salmonara’ is not an authentic dish, but my own invention. 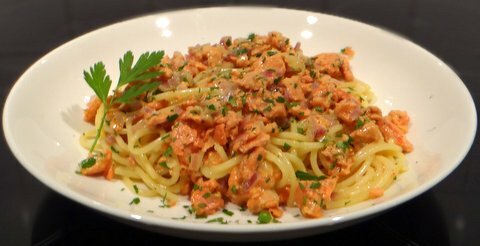 It is a fish version of the well-known spaghetti alla carbonara that uses smoked salmon and red onion instead of pancetta or guanciale. Just like real carbonara, the ‘sauce’ is raw egg that is only cooked slightly by the heat from the pasta. It only takes as long as it takes to cook the spaghetti. This dish is quick, easy, tasty, and healthy thanks to the omega-3 fatty acids in the salmon. Have not made these for ages and love the flavour . 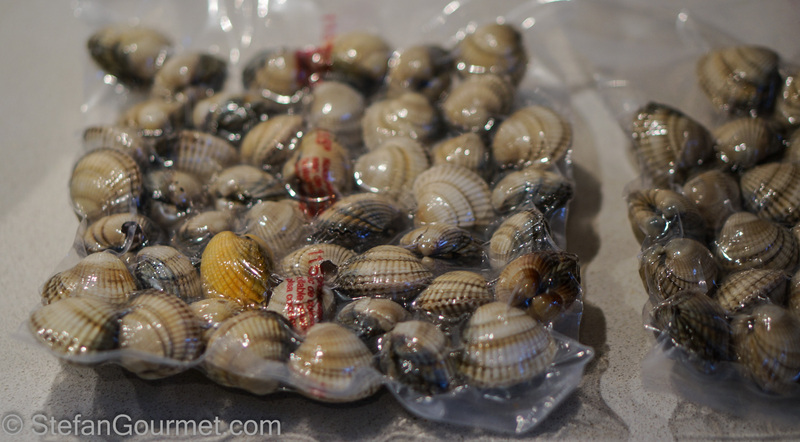 . . shall cook them in a sealed bag at 100C next time also: what a neat way to catch the clam juice! Delicious. You have them pretty perfect Stefan. Ho sempre usato il sottovuoto solo per conservare salumi e parmigiano! Devo evolvermi! Complimenti per la ricetta! These sound fabulous!!! They do look perfect – so well browned and yet so soft inside. 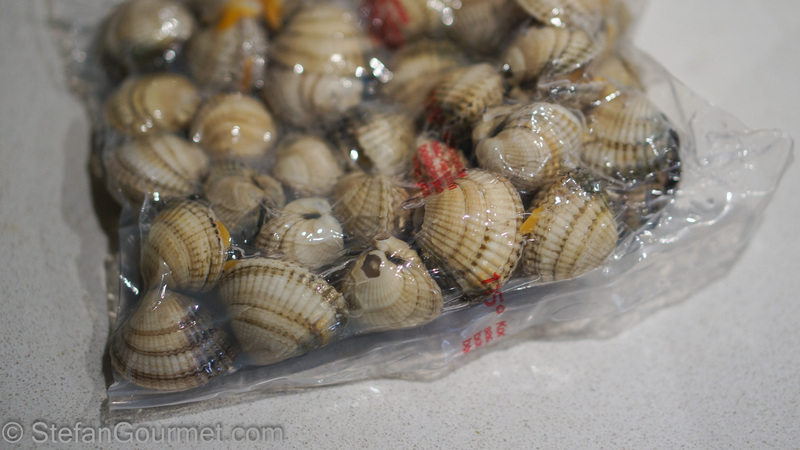 Nifty idea using a sealed bag to open the clams, Stefan. 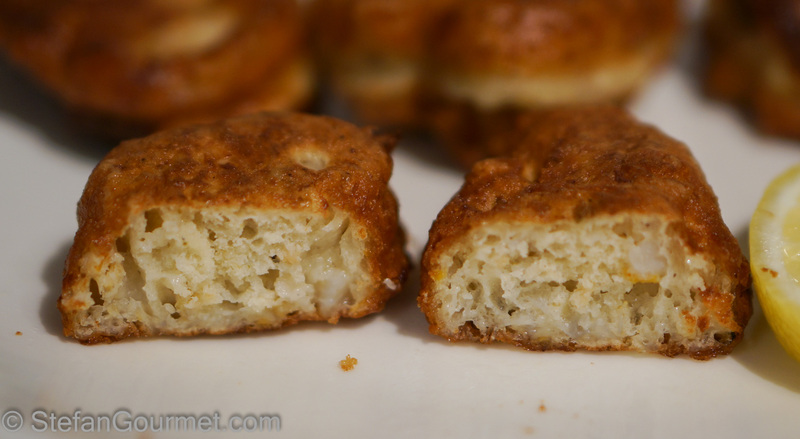 I know these as fritters and I’ve enjoyed them in the past. Never made them, though, and I bet yours would be far superior to any I’ve tasted. Thanks, John, for the nice compliment. You should make them, and I bet yours would turn out just as good (even though this is almost like baking). 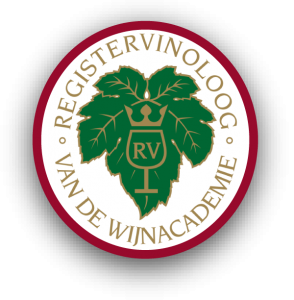 Dear Stefan, I’d be interested in your wine recommendations for this. I’m thinking a mosel Kabinet would be good. A dry one, yes, and also muscadet, piquepoul de pinet, or rias baixas albariño would work.